The new Emperor has decreed 100 days of games to honor the recently deceased former Emperor. Click here to play! Long live the Emperor! He has also decreed that every fight will be to the death and that the most successful gladiator in the games will be allowed to enter into marriage with one of his daughters. Oh glory to the new Caesar! The Glory of Rome slots celebrate the refined and the brutish about the ancient Roman Empire. Featuring symbols of Rome, such as X and IX numbers, lions, gladiators, chariots, legionary helmets, an emperor and a Roman maiden, the Glory of Rome slots offer a step back in time to one of the most cosmopolitan of ancient societies. Play the Glory of Rome slots today to see if your chosen fighter can win in the arena and impress the glorious Emperor of Rome. The Gladiator symbol is the scatter symbol in this game, paying out on the total bet. 2 symbols pay twice the bet, 3 pay 5 times the bet, 4 pay 20 times the bet, and 5 pay 100 times the bet. The Roman Emperor symbol is wild and substitutes for any symbol other than the scatter symbol. 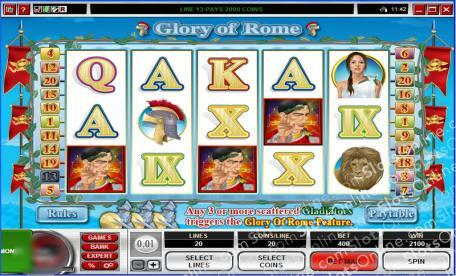 The Glory of Rome bonus feature is triggered when 3 or more Gladiator symbols land on the reels. In the bonus, the player chooses 4 shields to reveal random bonus amounts or free spins, and all regular wins are doubled during the free spins.